In the graph above I put up the weekly bullish-sentiment-readings from 2005 up to 14th January 2016. Both the dates (April 2015 & 14th Jan. 2016) have one thing in common: a reading BELOW 18.5%!. Extraordinarily low levels of optimism have worked best as a contrarian signal for potential Long-positions in the broad US-Market. Bullish sentiment has been below two standard deviations of its historical mean 16 times during the survey’s history (from 1987 onwards). The average and median six-month gains for the S&P 500 following these low readings were 14.0% and 17.7%, respectively. The average and median 12-month gains were 20.7% and 21.7%, respectively. The S&P 500 large-cap index rose every time after the AAII-survey indicated an extraordinarily low level of optimism. 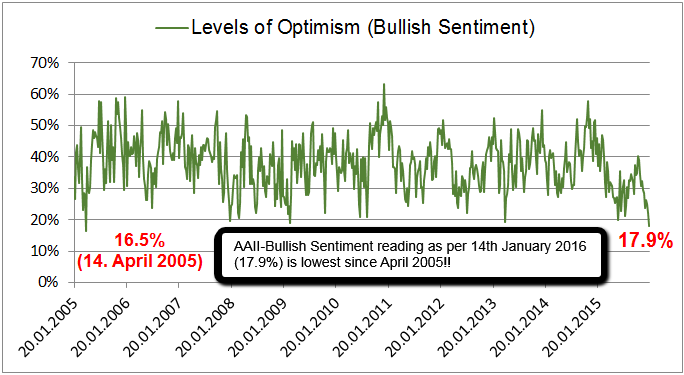 As per 14th January 2016 the Bullish Sentiment Reading lies 2 Standard Deviations BELOW the Mean! >> The S&P 500 marked an Intraday-Low of ca. 1,878 points and a closing-level of ca. 1,929 points on that day. Following the statistics above a rise of 14% would lead to a minimum level of 2,140 points on 14th July 2016 (1,878 x 1.14). 12 months from now, applying the statistics above the S&P 500 could be @ ca. 2,266 points (14th Jan. 2017; 1,878 x 1.207).